This page contains the answers to a number of frequently asked questions related to particulate matter and ozone pollution in the atmosphere. This list is not exhaustive and will be supplemented furtherin the future. If you have a question not in the list, or if you require further information, please do not hesitate to contact us at smog@irceline.be. Besides gaseous pollutants, the atmosphere can also be polluted by particles. These particles (either in suspension, fluid or in solid state), have a divergent composition and size and are sometimes called aerosols. They are often catalogued as 'floating dust', but are best known as particulate matter (PM). This floating dust is most often categorised based on their aerodynamic diameter. The aerodynamic diameter of a dust particle is the diameter of a sphere-shaped particle that shows the same behaviour in the atmosphere as a dust particle (which does not necessarily have a sphere shape). 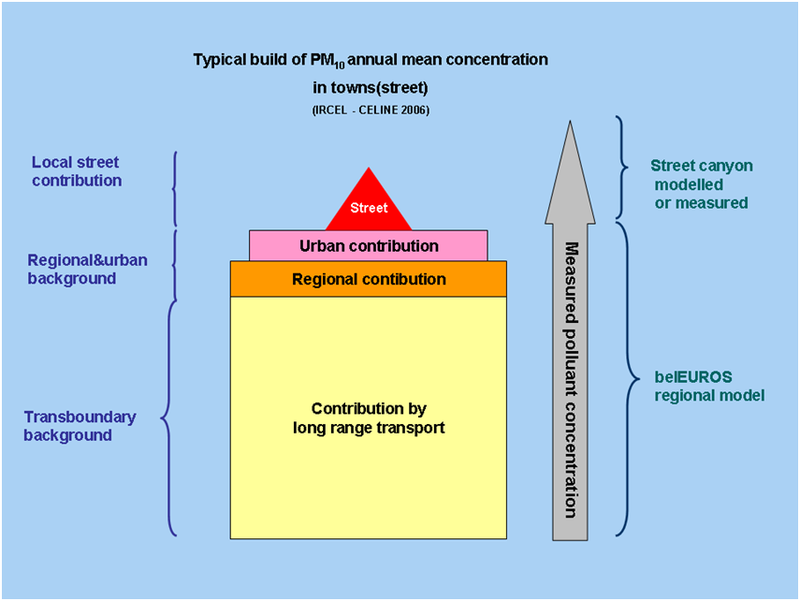 In the framework of air quality problems, particulate matter is the most important. This picture is a electron microscopic image of particulate matter on a filter that was placed near a road. Black carbon (the little, grey balls) is ubiquitous on this filter. The light blue balls are particles originating from combustion processes; while the pink particles are minerals and the green cubes are salts. Heating systems can use different energy sources: fossil fuels (coal, oil fuel, gas), biomass (wood,...) or natural sources (solar energy, geothermics,...). Only the systems using natural resources are emission neutral. Despite the fact complete combustion only leaves carbon dioxide and water emissions, most combustions are incomplete, thus also leaving polluting gases and particles. Most fuels also contain impurities or non-combustable elements, in variable amounts. As such, polluting emissions are dependent on the type of fuel and the technology used. During the last years, wood-based heating systems are being used more and more once again. Wood is often considered a clean, renewable and cheap energy source, because of which we would not have to use fossil fuels anymore. However, wood remains a 'raw' energy source, consisting of unrefined, complex elements. To ensure the emissions being kept very low, we should be able to perfectly control the burning process. Recent European studies have shown that biomass burning (burning of wood or vegetation) adds to air pollution to a large degree, mostly in winter. 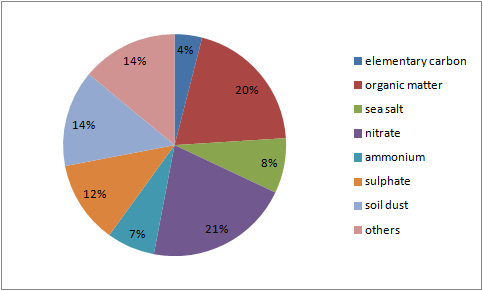 The European CARBOSOL project has studied the contribution of different energy sources on the fraction of organic carbon. The analysis methods used in the research used chemical tracers, such as levoglucosan, and also used C14 measurements. Levoglucosan - a sugar formed by burning cellulose - appears to be a good chemical tracer, allowing to unambiguously determine the emissions arising from biomass burning. C14 is a radio-active isotope of carbon that desintegrates too quickly (half-life of ca. 5730 years) to be found in fossil fuels, but that is present in biomass. 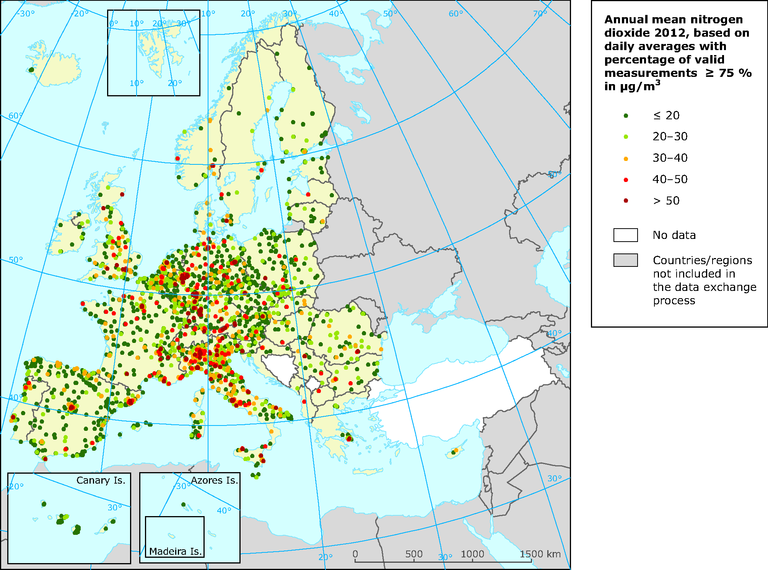 The results have shown that 50-70% of the mass of carbonaceous aerosols originates from biomass burning, independent of geographical location in Europe. To limit the pollution, and mainly the carbonaceous part, on a continental scale in winter, technological developments regarding biomass burning are required as well as rigorous reglementations to limit the possible applications.